Enjoying some free evening time, I was browsing the shelves in the BGG.Con game library. I’d heard that the new Street Fighter deckbuilding game was pretty good and wanted to check it out. Deckbuilding is an intriguing mechanism to me and a decent one is always worth a look. 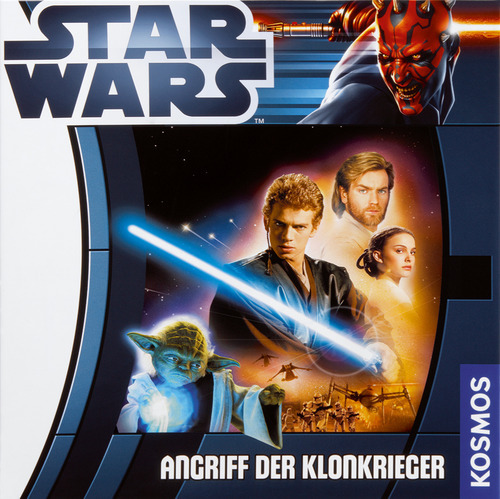 We never found Street Fighter but something else did catch my eye–Star Wars: Angriff der Klonkrieger. Licensed property games have, at best, a mixed reputation. Curiosity demanded we pull it down and take a look regardless. And what do we see? This Attack of the Clones tie-in is focused on the Geonosis battle from the climax of Episode II. Hasbro/Milton Bradley’s deeply disappointing Star Wars: Jedi Unleashed was also set in that battle. Might this game be better? But wait–this tie-in was design by Inka Brand and Markus Brand–these are the minds behind A Castle for All Seasons and La Boca. Why this tie-in could actually be good. Four of us found a free table and took it out for a spin. And I can happily report that Star Wars: Angriff der Klonkrieger is a decent cooperative game. More importantly, it features elements game designers should be studying. What follows is less a game review and more an analysis through the lens of a designer. 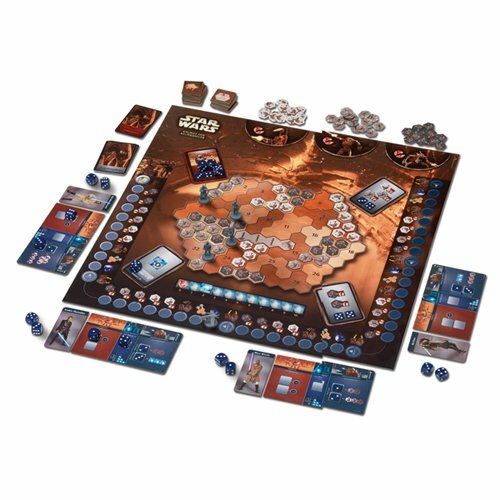 Like most cooperative games, Star Wars: Angriff der Klonkrieger gives players a large number of ways to lose but only one way to win. Keep from losing for five full rounds of play in order to win. At first glance, the number of ways to lose seemed overwhelming. As designers, we should make our game’s objectives transparent to our players. Even though we were able to completely understand them by the end of the first round, I would have liked this element to be clearer. In the narrative of this game, the end of the fifth round is the arrival of reinforcements and we jedi are struggling to hold out through wave after wave of enemies until those reinforcements arrive. The game includes a plastic shuttle which is used as a round counter. This is a nice touch to begin with–making the figurative notion of counting rounds into the literal by showing the shuttle approaching is already a good idea. Brian Yu’s Lemony Snicket’s A Series of Unfortunate Events: The Perilous Parlor Game similarly used Poe approaching the front door as a game timer. The round track in Star Wars: Angriff der Klonkrieger goes further than just round counting, however. The shuttle’s path includes a space for each step within each round. Carrying out a round then becomes straightforward: resolve a step, move to the next space and resolve that step. This implementation does an estimable job of keeping players focused on the game board and spares them trips to the rulebook. More designers and publishers should be pouncing on this approach. Jedi in this game are essentially invulnerable. Many Star Wars tie-ins take this approach. Apparently, physical injury is far too mundane for the knights of the old republic. In addition, jedi are nearly omnipresent. Nearly. Each jedi can travel an unlimited distance to attack enemy troops but only through empty spaces. Thus, instead of being defeated, jedi can be surrounded by troops and thereby pinned. Enemies swarm the board in one region at a time. These regions are drawn from a bag of tiles. There’s nothing particularly unusual about this but the graphic design is again well-executed. Each tile shows both the region’s number and an image of the game map with the area in question shaded. Quick and clean. The most unusual element of this game is its die allocation mechanism. Each player gets a set of dice to roll and allocate to their play mat or to special challenges surrounding the board. However, these dice are rolled one at a time. Each player rolls and places a die before any players move on to roll their next die. This element forces players to make tough decisions, sometimes committing to a course of action early in a round, sometimes deciding to completely ignore one threat to ensure their odds against another. While the die allocation mechanism does generate good tension, it has a shortcoming. 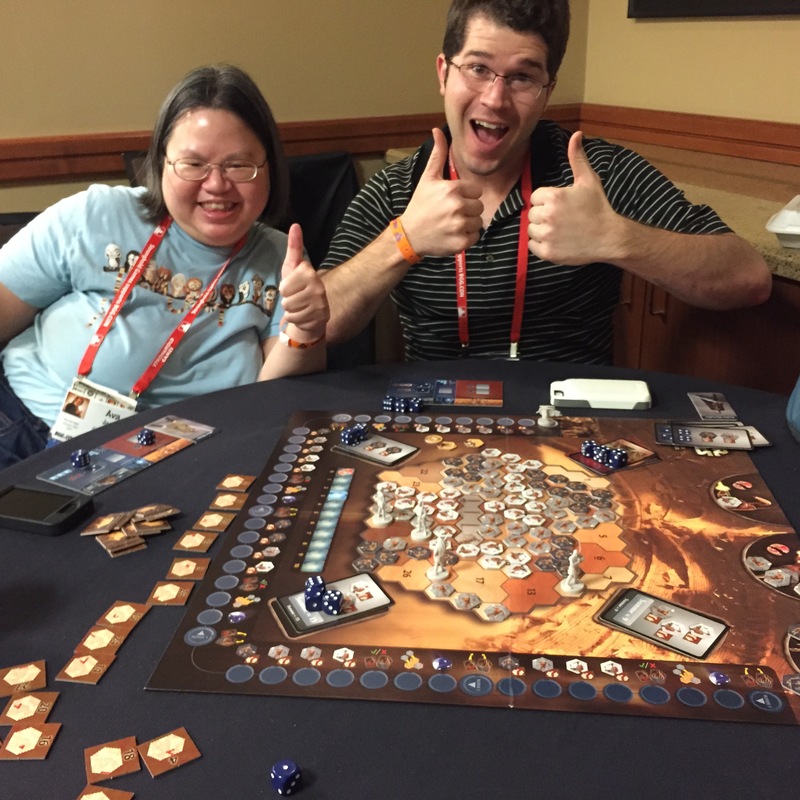 Like many cooperative games, Star Wars: Angriff der Klonkrieger lends itself to quarterbacking. One bossy player could easily steamroller the others at the table and generally run the game. I haven’t yet tried to design a cooperative game but it’s my belief that the best solution to quarterbacking is including a traitor. Since this game is strictly cooperative, no such stopgap exists. The players at our table were generally collaborative so we didn’t encounter this issue but I could certainly see where a different group could have a painfully autocratic experience. All in all, I’m glad we decided to take Star Wars: Angriff der Klonkrieger for a spin. Should you acquire it? Is it an essential game for every designer’s collection? Probably not. But you should definitely seek it out and give it a play. What do you think of the mechanisms in Star Wars: Angriff der Klonkrieger? Have you seen these elements in any other games? Which ones? Which used them better? Why? Share with your fellow readers in the comments below. And if you’re enjoying what you’re reading, create an account with WordPress and follow this blog. If you keep reading, I’ll keep writing. When you add a traitor it is no longer a coop game. The best solution to quarterbacking is for the other players to tell the quarterback to shut up and let players make their own decisions unless input is requested. Trying to design a coop game that prevents quarterbacking is a lot like trying to design a game that prevents cheating: it’s not a game design problem, it’s a personal priority problem. Cheating comes about when someone decides that winning a trivial boardgame is more important than competing honestly. Quarterbacking comes about when someone decides that winning a trivial boardgame is more important than the enjoyment of their fellow players. Don’t play with people who cheat. Don’t play with people who quarterback. “Don’t play with people who cheat” is certainly a reasonable stance from a player’s perspective, but I don’t think it absolves the game designer from considering how to improve the play experience for players who are willing to play games with people they haven’t vetted and run background checks on to ensure they’re not a “cheater”. The more opportunity there is in one’s game to cheat unaccountably, the more likely it is someone will do so, whether intentionally or inadvertently. Accountability benefits the table to prevent play mistakes as much as to prevent purposeful cheating. Imagine (as a fairly extreme case) if turns in Dominion were played behind a screen, so that the other players didn’t get to see what cards you playe each turn — only the effects that affect the table (purchases, attacks, etc). Could you imagine playing this way with your gaming circle? Of course you don’t THINK they would cheat, but do they understand the interactions of every card perfectly? Surely more play errors will be made without accountability, and those negatively impact the game in the same way intentional cheating does (if not to the same degree). Some players have the luxury of a carefully selected play group, either, and so a game that removes the opportunity to secretly cheat gives security to playing with players you don’t implicitly trust. Magic the Gathering has been designed nearly from the beginning to have zero accountability issues, because you may be playing against someone you’ve never met and will never meet again. Some of the rules to enforce this seem draconian (as an example, “morph” creatures may be played face down to conceal their identity until revealed. When a face down creature leaves play or the game ends before it’s turned face up, you must reveal it to your opponent to verify it truly did have the morph ability), but they ensure players can focus on the game itself, and not the intentions of their opponents to cheat or not. Quarterbacking isn’t “cheating”, of course, but the idea of trying to design a game to prevent or inhibit them is similar. For many players, there’s not a black and white distinction between “polite cooperative play” and “quarterbacking”, there’s just “I wish Jeremy would provide a little less input on my turns”. Not every cooperative game has to specifically address this issue, but ignoring the issue means that many groups will enjoy the game less, and, like any design decision that’s likely to alienate some players to the benefit of others, it should be carefully considered as part of the individual design. I guess I have the luxury of being pretty selective about who I play with, so I don’t have to worry too much about playing with people who exhibit bad behavior, whether cheating or quarterbacking or just generally being a pain. I have a hard time though understanding non-tournament circumstances in which, after you’ve warned someone a few times that their play behavior is unacceptable, you can’t just tell that person you will not play with them anymore. Why would you choose to remain in a situation where you are forced to play with such people? Isn’t that situation a more serious and fundamental problem than a flaw in the design of any specific game? Do we also need to add rules that require players to bathe regularly? I’m not absolving designers from doing what we can to make cheating difficult. But strictures in the game to stop bad behavior should be weighed against the impact to the play experience. The designer of Love Letter, for example, acknowledges and accepts that players could cheat, because adding measures to prevent cheating would impede the elegant nature of the play experience. Likewise, Kevin’s suggestion to add a saboteur element to a cooperative game would destroy the cooperative experience that many players seek, to prevent a problem that may or may not manifest in every group. I’m not against measures to reduce cheating. I’m not even against saboteur mechanisms. I’m against adding baggage to a game in hopes of mitigating _social_ issues that may or may not manifest. People should solve their social issues socially.